These charts clarify how TI makes money. Texas Instruments (NASDAQ:TXN) can be a hard chipmaker to understand, since it creates components for a wide range of products across multiple industries. However, four simple charts can make its business model easier to comprehend. What does Texas Instruments make? Texas Instruments once competed directly against Qualcomm (NASDAQ:QCOM) in the mobile application processor and baseband modem markets. However, TI phased out its baseband business in 2008 and exited the mobile processor market in 2012, mainly due to Qualcomm's dominant presence. TI has notably been reducing R&D expenses across several categories to invest in its industrial and automotive segments, which the company believes will eventually post higher margins and "stickier" revenue growth. The communications segment, which posted a 20% sales decline last year, has been a soft spot due to delayed wireless infrastructure upgrades by telecom companies. There are also concerns about TI's exposure to Apple, which generated 11% of its sales in 2015. TI provides IC chips, display drivers, and other components for iOS devices. If iPhone sales decline annually this year, TI's personal electronics revenue could drop more than expected. The transition toward analog and embedded devices has steadily reduced TI's capital expenditures and bolstered its trailing 12 month free cash flow, which rose 6% annually to $3.7 billion last quarter. At the end of 2015, TI declared that it ranked in the top 15% of the S&P 500 in terms of free cash flow generation. Over the past 12 months, TI spent 62% of its FCF on stock buybacks and the rest on dividends. Over the past 12 years, TI reduced its share count by 41% and raised its dividend annually. Today, the stock pays a solid forward annual dividend yield of 2.9%. That margin expansion and the reduction of capex from analog and embedded devices should keep TI's earnings growth on track. 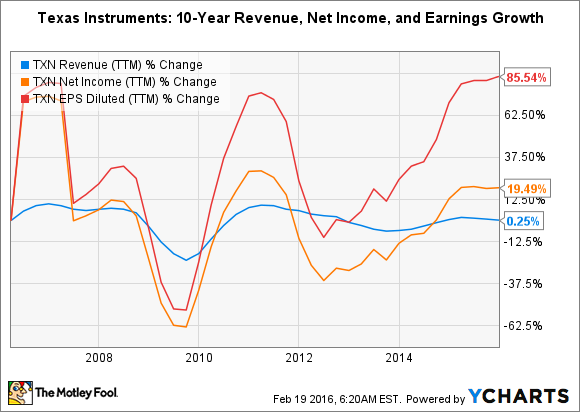 Over the next five years, analysts expect TI to grow its earnings by 10% every year. Looking ahead, TI can acquire smaller chipmakers to boost its production capabilities. By doing so, it can further expand its margins by combining economies of scale with its 300mm wafers. TI nearly acquired industry peer Maxim recently, but walked away from that deal due to the company's $9.5 billion valuation. However, I suspect that TI is still shopping around for smaller analog chipmakers. Should you invest in Texas Instruments? In a previous article, I discussed TI's core weaknesses -- its exposure to Apple, concerns about industrial customers, and sluggish growth in wireless infrastructure. However, I also believe that TI's robust margins, well-diversified business model, and dedication to boosting shareholder value outweigh those weaknesses. TI certainly isn't an exciting high-growth stock, but I believe that it's a fairly stable chip stock which has outperformed many of its peers since the beginning of the year.